BB is used to being furry and warm despite the 90 degree temperatures here this week, so she had no issues wearing this wooly scarf made from Noro Transitions. Like the pattern? The PDF is yours free when you sign up for my new (as in I haven't finished writing the first issue yet) free monthly knitting and crochet newsletter. 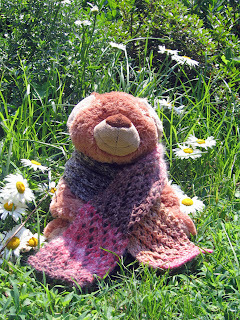 Click on over to http://www.secretlanguageofknitters.com/ and sign up under BB's photo, if you wish. The first issue will be out in August. At least I have finally finished knitting something I can actually show you! Still working on the Surf socks for the kid, the crocheted shawl for a yarn company, and some swatches for yet another yarn company. And writing, of course, cruising right along on the log home book. I was recently profiled on a writer's blog - check out the interview at K.C. 's Write for You if you are so inclined. A lot of people asked me about how I got the deal for the knitting book - some of the information is here. I guess that's it for bits and bobs of information today - enjoy your weekend, all! 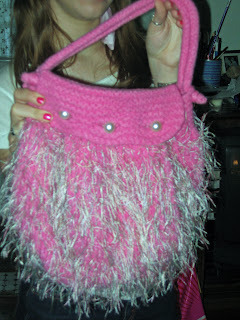 Here is the most recent muppet pelt purse - once again in Cascade 220 with whatever eyelash was on sale, from the pattern in the book Pursenalities. Once again a very pleased recipient - not the Kid this time but a good friends of hers who was celebrating a birthday. 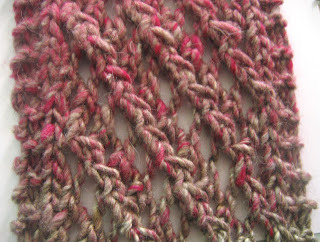 I am crocheting away on a shawl for a yarn company, but I can't show you that until it releases in September. (ahhhhh September, when it hopefully won't be 90 degrees). Speaking of September - did I mention I am going to be on a knitting cruise on the Hudson River that leaves from Newburgh NY? I thought not. September 23 from 2 - 5 - more info at Cornwall Yarn Shop I missed this even last year and can't way to go this year. Caught Hairspray the movie last night. Maybe I am biased by my Broadway roots but I liked the play much more than I liked the movie, although the movie wasn't half bad. I didn't get why they changed what they changed (and cut my favorite song - Mama, I'm A Big Girl Now!). I did love that John Waters had a cameo as the flasher in the opening montage. And Nikki Blonsky rocked - she had a much sweeter tone than the B'Way Tracy's have had. Off to do some telephone interviews for an article, then to sit in front of the fan and drink ice water for a while! 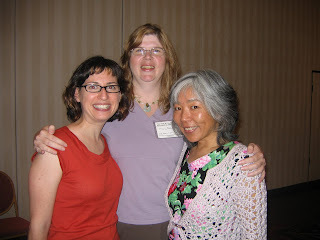 As usual, I took no good pictures while I was away - but the lovely and talented Jill Hanratty snapped this one of me, Kim Werker from Interweave Crochet magazine and Crochetme.com , and the eternally blogless but amazingly talented Doris Chan of Amazing Crochet Lace fame. And no, I am not standing on a box - that is an alarming combination of me being very tall and Kim and Doris being petite! Why were we hanging out together? You will have to read the next Interweave Crochet magazine to find out! Well, that and we all happpen to genuinely like each other, which is nice! Doris and I were doing book signings at different times in the same booth (The Elegant Ewe) so we saw each other at the changing of the guard. A somewhat confused crocheter handed me Doris' book to sign and I acted like I was going to do it thinking she would realize that I wasn't Doris and laugh, but she didn't get it so I had to politely explain that it wasn't my book. Another shining example of the fact that my humor is not necessarily everyone else's. I was working on the kid's dress for the fashion show right up until the last possible moment, but all worked out in the end. There was another tween girl there too and they strolled the runway together. much to the delight of the cheering crowds. It was awesome - and I swear I will post photos of the dress once I actually take some. The kid and her model friend had about the same proportion to each other as we all do in the above photo - the kid will apparently be a very tall chip off the old block! And now there is actual non-work-related knitting happening in the house - yay! I went stash diving and picked some Regia Surf from the closet. I wanted a pair of socks for me, but the kid saw the vibrant colors and asked very nicely if she could have them instead, so guess who they belong to now? The good news is her foot is shorter than mine so they are going pretty fast - I needed some instant gratification while I wait for boxes of yarn for new designs to arrive. I get to stay home this week - whee! I have some work to make up since I spent this whole weekend reading Harry Potter 7. I don't consider myself an obsessed fan, but I wanted to get through it before I inadvertantly saw or heard a spoiler. I have to say though - we went to a Harry Potter party at the local indie book store on Friday night and guess which other book they had just gotten in, and placed neatly by the cash register? It was very cool for me to see SLoK in the wild, and I refrained, just barely, from forcing everyone in the store to look at it. 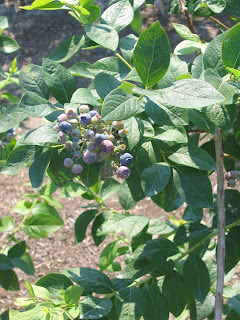 So since it was 1200 degrees last week, the thing the Kid absolutely wanted to do was go blueberry picking in the hot sun. She doesn't actually eat blueberries, mind you, she just wanted to pick them. 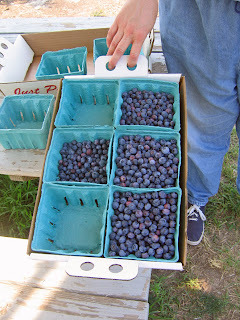 So I thought no big deal, we will just whomp some berries in the pint boxes and be out of there in no time. City girl that I am, I didn't realize that they weren't all ripe at the same time and you actually had to look and see what you were doing! But it was fun (if sweaty) and I made the middle sister come along to share the torture. I am always jealous of garden pictures at this time of year when I have a brown thumb, so you can just pretend I had something positive to do with all of this green-ness. Then I shipped off at the last minute the "geez can you make a pillow to go with that throw?" pillow. 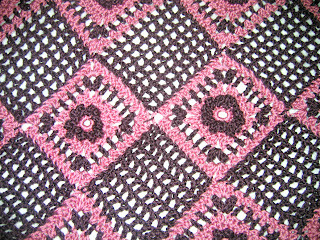 I like it - it is the basic square from the Raised Flowers Throw on steroids. The funny thing was that I had already handed down the leftover yarn from the throw before I got the phone call asking for the pillow, so I had to beg my friend DC to give it back! I didn't use much though, and I will re-give it to her sometime this week. Along with some other yarns and goodies - I made a random drop in at an outlet store in MA that I haven't been in in years and found knitting needles at 3/$1.00. That is not a typo, three needles for one buck. DC is a new knitter and stash deprived, so I loaded up a big bag of goodies to bring home for her. I also spent some time at The Knit and Crochet Show in New Hampshire - but I am still sleeping off the willpower needed to not fill the entire van with Habu yarns so I will blog about that later in the week. Off to knit socks from stash yarn and wallow in my virtue. Sometimes you get lucky and the large throw project gets finished BEFORE the heat wave hits! 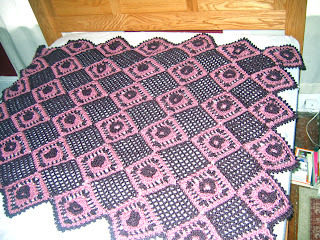 This is my most recent pattern for Caron - a crocheted throw in Simply Soft and Simply Soft Heather. Thankfully they liked it and have asked for a matching pillow. 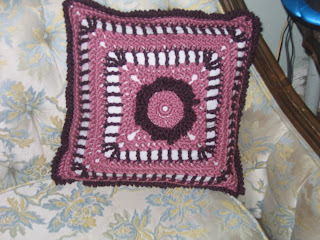 Well, actually a coordinating pillow - rather than do the small squares I did for the throw they would like a large square - the basic square on steroids. Making the pillow wasn't a big deal, writing the pattern is making my head ache. Thankfully I have a bit of help on that front in the form of my CGOA mentor. In book news - I put up a web site just for Secret Language so that the blog doesn't start to look like a long form advertisement. Click over to Secret Language of Knitters for excerpts, reviews as they are published, and my tour schedule. Next week New Hampshire - anyone else? 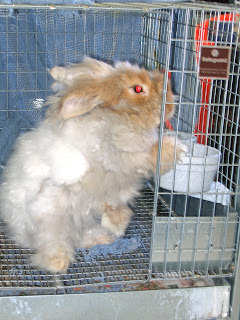 Because we have been bunny-free for so long..
A photo of Cameron T. - looking like a demon bunny with his red eyes. He has had a summer haircut (not that you can really tell, but believe me he has! ), and is somewhat lighter in color than he was when I got him. He would really like something interesting in that bowl now, really, he would. He has become addicted to Wacky Wabbit rabbit cookies and it is pretty funny to watch him eat them. He immediately scurries as far away as he can (in case I should change my mind and want it back I suppose) then he peels the dried fruit off the top and eats that, then he eats the rest of the seeded cookie. Kind of like kids with Oreos that have to lick the insides out first. We saw Cameron's alter ego at a local carousel last weekend - the carousel at Bear Mountain Lake in New York has beautiful animals in addition to horses - rabbits, lions, bears (of course), foxes, etc. Love that carousel. No knitting to speak of - I have finished a gift for someone but she reads the blog so you can't see that until next week. And I have been working on the last few projects for Caron Yarns, and a dress for the kid to model in the Knit and Crochet Show fashion show next weekend in New Hampshire. Busy, but not visually appealing. And guess what? Amazon.com is shipping the book now! I haven't seen it in the wild yet (like a local book store) but those of you who pre-ordered (for which I thank you) should be getting your copies any minute. Book signings start next week, and I swear that one of these hours I will get around to posting a schedule.